Which breed of dog is your favorite Linux distro? As I zoned out this morning, sipping coffee and watching my dogs wrestle on the couch, I wondered, "If my dogs were Linux distributions, which ones would they be?" Yes, these are the thoughts that run through my head as I get started in the morning. I also thought about which dog each operating system would be. I decided that Otis, my pit bull rescue from the Humane Society, is a lot like Linux. 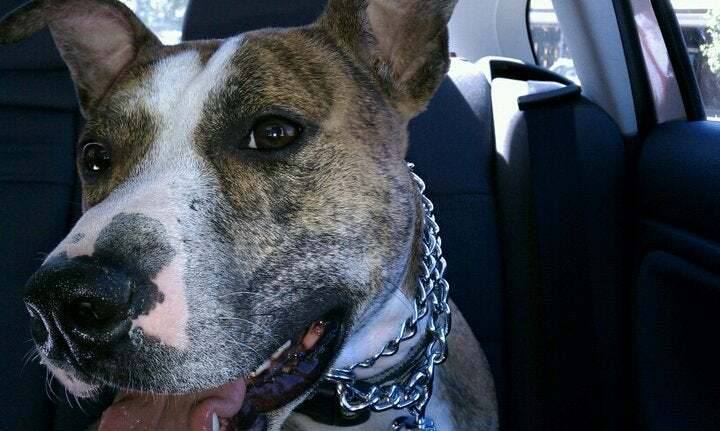 For one thing, the term pit bull, like Linux, could mean a mix of a variety of genes and breeds. Animal rescues are full of pit bulls, which can be hard to adopt out. For one thing, people are afraid of the breed, mostly because they don't understand them. Their reputation scares some folks away. Sounds like Linux, right? Then there are the breed-specific legislation obstacles, which can prevent people from adopting pit bulls. This reminds me of the system or corporate requirements that sometimes make using Linux a problem. Thankfully, there are volunteers who eagerly work to stop the spread of FUD (fear, uncertainty, and doubt) around Linux and pit bulls. Those of us who have adopted a pit bull (or a Linux) understand that they are quite misunderstood. Otis, like my Linux, is eager to please me and wants to make me happy. He's smart, friendly, and willing to adapt to my lifestyle. Of course, our relationship has taken a bit of work over the years. Otis came into the household with quite a few bugs and we simply didn't communicate well. Sometimes, our communication broke down completely. Now that we understand each other better, Otis isn't so hard to manage on our walks and he's happy to return when I call him. Actually, I adore him. He might not be the easiest pet I've ever had, but he definitely has the most desire to please me. In addition to a few Linux laptops, I have a MacBook Pro. I'm thinking MacBook Pro is nicely represented by a German Shepherd. They aren't cheap, but they are popular, strong, smart, offer good protection, and are practical for a variety of situations. No wonder so many professionals rely on German Shepherds to perform their jobs. What breed do you think Windows would be? I'm thinking Windows would be the purebred puppy you bought on sale, but then ends up costing you a small fortune. You thought you got a good deal, but not long after you get your pretty new puppy home, you find yourself on the phone with a vet trying to diagnose which virus is making your pup lie around with no connection to the outside world. Or, even worse, you come home after a long day of work and discover that your discount dog quietly watched burglars steal your valuables. Could something be wrong with your dog? No, you're pretty sure this is just what dog ownership is all about. You have a registered purebred, after all. These things are always high maintenance and expensive, right? And now for the Linux distributions. Ubuntu is a Boston Terrier, like my dog, Olive. Whereas Ubuntu has Debian lineage, Boston Terriers are descendents of Bull and Terrier-type dogs. Like Ubuntu, Olive is fun, playful, attractive, and looks adorable in a sweater … err, pleasing desktop. But she can be quiet serious at times, guarding the front door and making sure no one sneaks in past her. She learns quickly and plays well with others. Sometimes when I come home, she won't wake up right away. Best of all, she's relatively low maintenance, as long as I take good care of her and give her a little attention when she needs it. Knoppix is a St. Bernard, bred for rescue. This one is obvious. Red Hat is an Affenpinscher. Whereas an Affenpinscher won Best in Show at the 2013 Westminster Kennel Club Dog Show, Red Hat won the title of first billion-dollar Linux company. Both Red Hat and Affenpinscher have strong work ethics, are confident and protective, need regular training, and can be difficult to housebreak. Neither are recommended for homes with small children. Fedora, which comes in fourth place on DistroWatch, is a Golden Retriever, the fourth most popular dog breed. Like Golden Retrievers, Fedora is good natured, intelligent, and eager to please, and sometimes a little goofy. Golden Retriever puppies mature more slowly than other breeds, and Fedora is on a similar growth path. Both are playful and have lots of potential, but they also require plenty of your time and energy. If you don't have time to exercise your pup or tweak your distro, this might not be the breed for you. On the other hand, if you are willing to put in a little effort and work, this one might be your perfect fit. Linux Mint is a Black Labrador mix. Both are easy to adopt, even if more people don't do so. Linux Mint gets the top spot on DistroWatch, whereas the Labrador Retriever holds the top spot as most popular registered dog breed. Linux Mint and Labradors are both known for being well behaved, playful, and good for a variety of uses. Now it's your turn: Which breed of dog is your favorite Linux distro? Tell us about it in the comments.